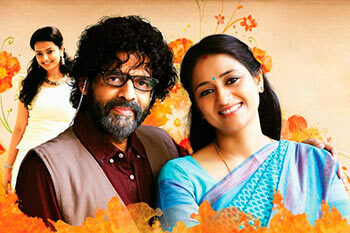 Balachandra Menon has lost his touch with Njan Samvidhanam Cheyyum, writes Paresh C Palicha. Digital technology has made film-making so easy that anyone with a decent cell phone and internet connection can aspire to be a filmmaker. Veteran actor-director Balachandra Menon, however, would like us to believe that things have not changed and breaking into this field is an arduous task even today. Njan Samvidhanam Cheyyum is the story of a middle-aged father who decides that he will direct a film on a whim and quits a cushy job as a bureaucrat in a film corporation. The film includes a lot of observations made by Menon in the film industry. He starts with leading ladies opting to marry and leaving the industry at the peak of their careers and making comebacks after a couple of years after seeking a divorce. Bank manager Gayathri makes some progressive points about leading a happy family life where she talks about individual freedom inside the marriage, trust, faith and such things. The next thing we see is she conducting a havan at home for her daughter, who is adamant on becoming a film director. Gayathri is the wife of Krishna Das (Balachandra Menon), who has stayed separately from his wife due to his transferable job. She puts on a brave face in public but is insecure about her husband’s lifestyle. She calls him back to advise their daughter against going into films but instead, he announces that he is going to direct a film. It takes very little to convince her and the film gets made in a jiffy. It is praised for its natural and realist treatment in the previews. In the second half, the attention shifts to the jury of the state awards comprising of Menaka, Renji Panikkar, Vineeth, Ravindran and others. Here we get to see the deliberations, fights and manipulations among the jury and how deserving films get discarded for undeserving ones. Menon depicts the events that have happened in the state award juries in the last few years here. The treatment of this film is so tacky that we feel sorry for Menon, a director who once was a trendsetter.